Please come and join us this Sunday as we help elect Umnesh Desai to the GLA and make Sadiq Khan our mayor of London. All welcome. Bring a friend. Training provided. Join us on the #Labourdoorstep campaigning for Kez and her great team of candidates in the run up to the Scottish parliamentary elections in May. All Labour party members are welcome. Bring a friend. Training is available for new canvassers. Email lab3seats@gmail.com to confirm your place. 10am – Croydon North. Meet at Thornton Heath Train Station. 1pm – Croydon South. Meet at Waddon Train Station. (Direct train between Thornton Heath and Waddon). 3.30pm – Carshalton & Wallington. Meet at Wallington station. (Direct train between Waddon and Wallington). All Labour party members welcome. Training available for new canvassers. Bring a friend! The Welsh Assembly elections in May are important for Labour. Cardiff Bay is the only national Labour government left in the United Kingdom and has a proud record. Returning good Labour members in constituencies and on the lists in key to ensuring a Labour alternative in Wales to the harsh policies of the Tories in Westminster. Join us on the doorstep. Get in touch with Richard Angell on 07966 161 444 or by emailing here. Thank you to all those who came to the Lab3seats campaign day in Lambeth and Southwark this weekend! It was great to see lots of people our on the doorstep. If you couldn’t make it don’t worry, we have more campaign days planned! Please let us know if you are able to come to either of these campaign days. All Labour members are welcome, bring a friend, training is available for new canvassers. Following the three seats challenge model, on Wednesday 1 and Thursday 2 April 2015, the campaign continues in Scotland to help comrades up against the Scottish National party. 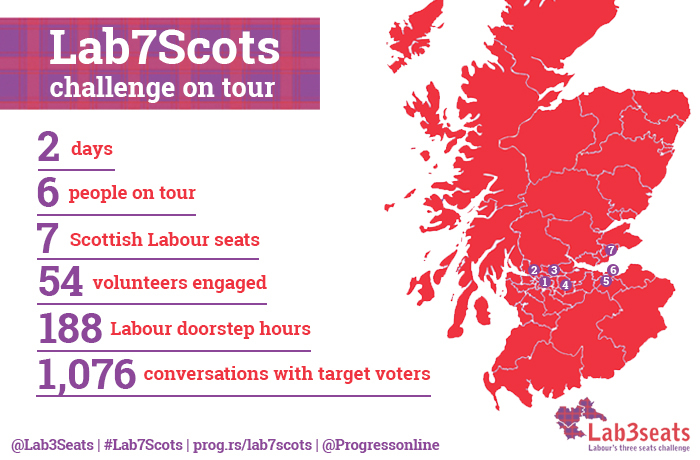 In two days, in seven seats, the volunteers on Lab7Scots over 1,000 conversations were had. The tour was done in partnership with Progress. This entry was posted in Lab7Scots and tagged Airdrie and Shotts, Anas Sarwar, Cumbernauld, Gemma Doyle, Glasgow Central, Gregg McClymont, Kilsyth and Kirkintilloch, Pamela Nash, Scotland, West Dunbartonshire.